Protagonist Vs Point of View: Two key decisions that the writer has to take at the beginning of the writing process are, to identify who the Protagonist is and to choose from whose Point of View the story will be told from. What defines a Protagonist? It’s the character whose decisions drive the action. It’s the only character of the script that cannot be left out when summarising the story in a few sentences. Try to summarise Raiders of the Lost Ark without mentioning Indiana Jones (Harrison Ford). Try with Butch Cassidy and the Sundance Kid without naming Butch (Paul Newman). Try with Casablanca without mentioning Rick (Humphrey Bogart). Try with The French Connection without naming Popeye Doyle (Gene Hackman). Try to summarise The Silence of the Lambs without mentioning Clarice Starling (Jodie Foster). She is the protagonist of the film. What about Hannibal Lecter (Anthony Hopkins)? For some he is a co-protagonist, for some -I’m one of them- he is a fantastic supporting character. But the film is the story of Clarice chasing a serial killer called Buffalo Bill. Lecter is like Yoda in The Empire Strikes Back, a great character that steals the show every time it appears, but not the Protagonist. In most films, Protagonist and Point of View coincide: The main character tells the story, we see the film through his/her eyes. In Jaws we see the story through the eyes of Chief Brody (Roy Scheider’s character). In Rocky we see everything from Rocky’s point of view (Sylvester Stallone’s). In Bridge of Spies we witness the story through the lawyer James Donovan’ eyes (Tom Hanks’). Those were choices. Jaws could have been seen from the shark hunter’s eyes (Robert Shaw’s act) or the ichthyologist’s (Richard Dreyfuss’), instead of Scheider’s. In fact, the three names crown the film poster with equal size, but that wouldn’t change the Protagonist, just the narrator. The same applies to Rocky. It could have been told from the coach’s Point of View, or Rocky’s wife’s, but Rocky still would be the leading character. Bridge of Spies could have used the point of view of the spy, so wonderfully acted by Mark Rylance, without taking an inch of protagonism from Tom Hank’s lawyer. Please do not take Point of View literally. It neither implies the existence of a voice over, nor the physical presence of someone witnessing the events at all times. It is a general point of view from the character that is basically telling you the story. In many cases, though, Protagonist and Point of View differ. Mills (Brad Pitt’s character) is the leading character in Seven, but we see the story through Somerset’s eyes (Morgan Freeman’s). A famous case is Star Wars, where the main character is Luke Skywalker, but the Point of View belongs to… the droids. C3PO and R2D2 tell the story. They provide comic relief and Point of View. 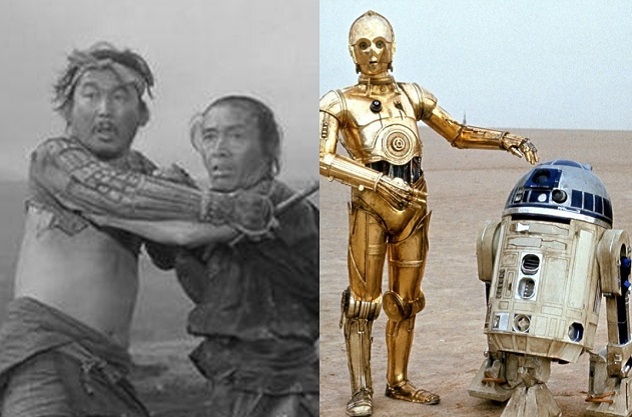 Lucas based those characters on the two peasants of The Hidden Fortress (Akira Kurosawa, 1958), in which they provide comic relief and Point of View too. One of them is tall and the other very short. Rings a bell? Great film, by the way. Here you have Lucas himself confirming this. What’s best for your script? Just analyse what you get from one and the other. Do you want the audience to share First Person in the ordeals that your main character is going through (like Rocky or Jaws) or do you prefer to keep distance so your narrator sees the whole picture evenly from the outside (like Star Wars)? This is only for you to assess. This entry was posted in FILMMAKING, POSTS on filmmaking, POSTS on screenwriting, SCREENWRITING and tagged Point of View, Protagonist, Star Wars, The Hidden Fortress. Bookmark the permalink.